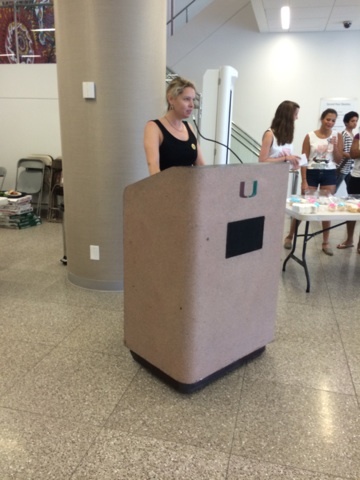 Students from Professor Katharine Westaway’s women’s and gender studies class gathered in the Lower UC Lounge Thursday for Canes Consent, a sexual assault awareness event. The class organized the event after several students went to Westaway about their experiences being assaulted. Adam Troy, health educator at the Student Health Center, spoke about the role of men in preventing sexual assault. Troy specifically emphasized how the vast majority of rapes are committed by a male acquaintance of the victim. Miro Falic was one of two males involved in planning Canes Consent. Falic explained how his point of view has shifted since he started taking the course in Women’s and Gender Studies. “You view things differently. People don’t know [facts about sexual assault]… but as you explain it, people become more interested,” Falic said. Organizers, clad in white ‘Canes Consent’ tank tops, helped educate students on available resources by inviting various organizations to set up booths at the event. NOW, Student Government, UPride, the Women’s Fund Miami, Yellow Rose Society and Canes Care for Canes were all present. When creating the event, students wanted to make survivors feel comfortable enough to contact any of the services on campus by having them at Canes Consent, according to senior Divya [her full name was not included for privacy concerns]. “There are so many constructs that are accepted that you don’t realize and you just play into in your everyday life,” Gonzalez said. The event featured a bracelet-making station, free food, T-shirts, a DJ and guest speakers. 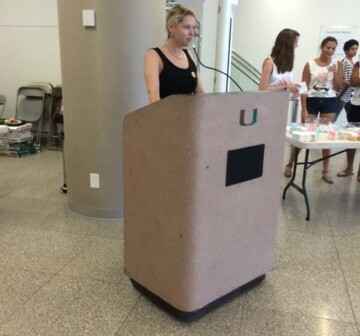 Canes Consent aims to host events every semester to raise awareness about sexual assault.